Maryhill Museum of Art is home to a small but important collection of art glass by French artists from the Art Nouveau and Art Deco periods. Many of these were acquired in France in 1914 by Alma de Bretteville Spreckels. She purchased them directly from the son of Émile Gallé, who had died in 1904. Émile Gallé (1846–1904), a leading figure in the French Art Nouveau movement. His work emphasized naturalism and floral motifs with a particular interest in cycles of nature. Gallé was captivated by Loïe Fuller. He was introduced to the dancer’s performances by a mutual friend, Roger Marx, and found correlations between nature and the way Fuller manipulated her silks. In 1897, Gallé wrote his friend, François-Rupert Carabin, and asked for photographs of the artist’s sculptural series of Fuller dancing. DEC ART Galle Vase with peacock 1951. 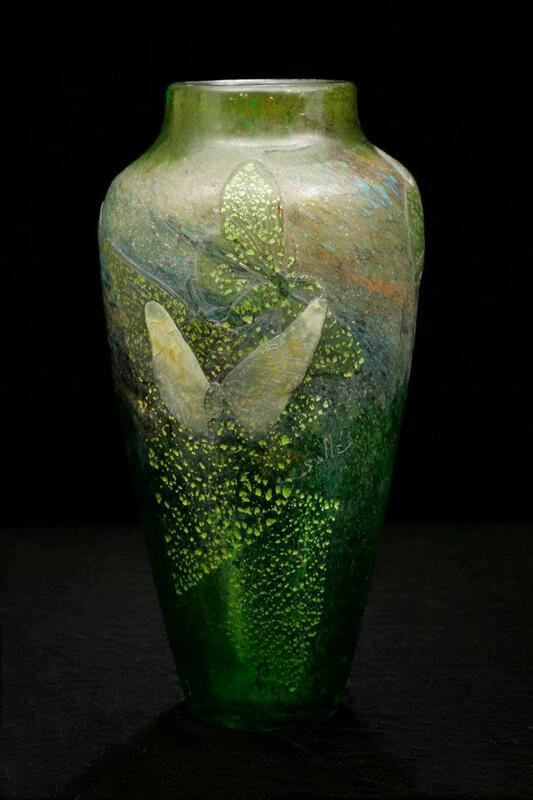 In Maryhill Museum of Art’s Papillon vase, Gallé used metallic inclusions and powdered color glass to evoke a stylized form of a butterfly in the open air. The image, with wings outstretched, owes much to Fuller’s performance of “Butterfly” (1892), with which she took Paris by storm. 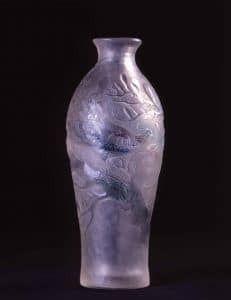 Also on view at Maryhill are Art Nouveau vases created in the Daum studio in Nancy, France, by the brothers Auguste (1854–1909) and Antonin Daum (1864–1930), and Art Deco vases by René Jules Lalique (1860–1945) and Edouard Cazaux (1889–1974) for Verrerie d’Art Degue (active 1926–1939).